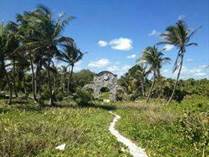 Approximately 78 miles south of Cancun on the Riviera Maya, are two of the largest most beautiful bays along the coast. These two mainly residential communities are ecologically sound and having very recently acquired electricity, many homes still, and choose to continue to use, solar or wind generated power. Tankah and Soliman Bay are paradise to sun-seekers, divers, and those in need of good R&R, with cool white sand beach stretching far and wide and breathtaking snorkeling. Services are just a few short miles down the highway. "Beachfront Villa in Soliman Bay"